One of Russ Sichley's first jobs was as a caddy at the local golf course in Beatrice, Neb., where he started working when he was about 10 years old. He loved being out on the green in the fresh air, and you couldn't beat the pay — he earned 25 cents every nine holes he worked. That money helped him buy his school clothes. Always willing to go the extra mile and help out someone in need, Sichley was not afraid to get his hands dirty and work hard. Just last summer you could find him out pressure-washing the sidewalks around the retirement community where he lives, doing something nice for his neighbors. But Monday afternoon, Oct. 29, Sichley relaxed. 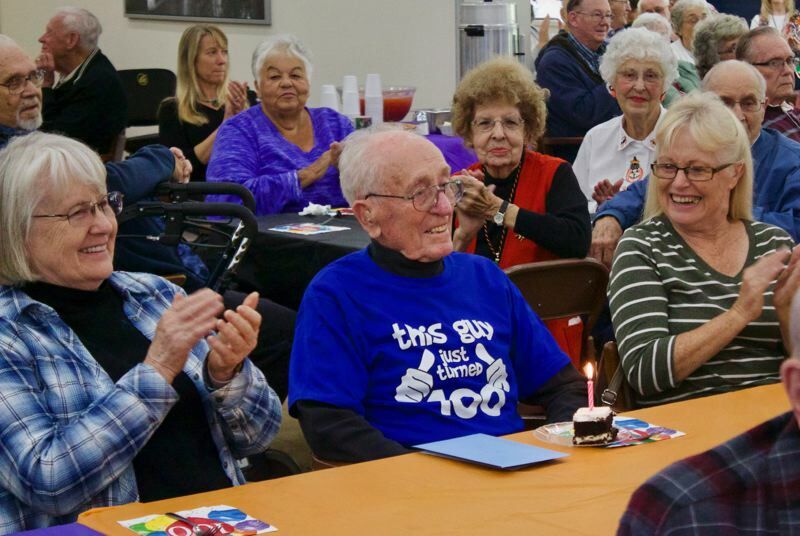 Surrounded by family and friends on the occasion of his 100th birthday, it seemed as if he'd earned it. "It feels great," Sichley said. "I'm lucky to be here and thank the Lord for all of this." The party was held at Village Retirement Center, where he has lived for 36 years. 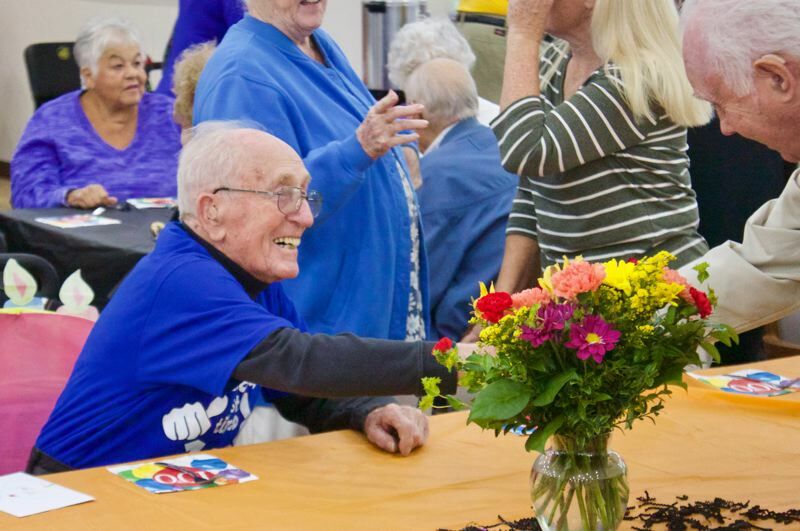 There was cake and punch, balloons, a basket full of cards and well-wishes, trivia, music and lots of laughter as people told their favorite stories about Sichley. When he blew out the candle on his slice of cake, Sichley joked he needed help from everyone in the room to make sure his wish came true. This was his second party in celebration of the milestone birthday, as he also had a smaller party with family on Sunday, October 28. "I'm lucky. You don't usually get two birthdays," Sichley said, laughing. Sichley was born on Oct. 28, 1918, to Russell and LuLu Sichley in Colome, S.D. He grew up in Beatrice, Neb., as part of a large family, the seventh child of 12, with five brothers and six sisters. One of his earliest claims to fame was becoming the marble champion in the sixth grade, winning a small prize, a write-up in the newspaper and a lapel pin. Another one of his early jobs was at a roller skate rink, where he made a dime every night putting skates on the kids. Every summer Sichley traveled with his dad and uncle to help set up their ferris wheel, merry-go-round and glider at the many local festivals and fairs. The went from Minnesota to Texas, and everywhere in between. Sichley joined the Navy in 1943, serving during World War II on the destroyer USS Lang until 1946 when he came home and met the love of his life. He married Mary Langley on March 3, 1946, in Marysville, Kan. The couple had four children and moved west to Portland where they build their home and raised their family. Sichley worked for the city of Portland on maintenance and road repair for about 18 years, and then for the United Medical Labs. When he retired, his doctor told him to find a way to stay busy and not just sit around — an easy prescription for Sichley to follow. He and Mary began volunteering for the Portland Adventist Community Services (PACS) in the early 1960s, and also helped at Portland Adventist Hospital. Sichley volunteered more than 24,000 hours with PACS and 8,000 hours at the hospital. His family said he is "totally unselfish and always giving to others."